My first trip to Cheluna Brewing was just a tiny bit confusing. 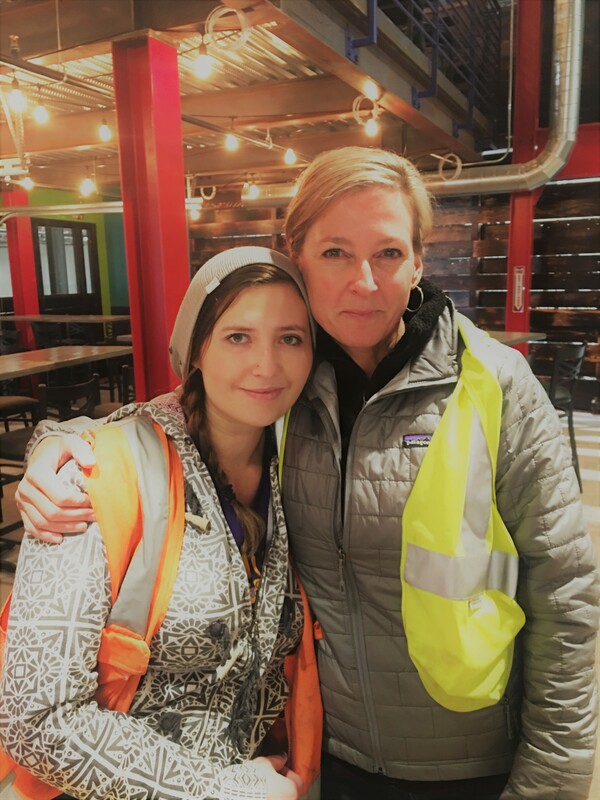 I was met by Javier Perez (Javi) outside of the building with an orange vest and a hardhat in order to enter the building. The Stanley Marketplace was buzzing with construction workers, tools, and an unmistakable “Javi energy” overshadowing all of it. I quickly felt like I had belonged there. Javi and his wife Jennifer were incredibly friendly and welcoming. I mean, they fed me beer and a bagel for breakfast. What’s not to love? The lovely Jennifer and I getting to know each other over bagels and beer. Photo by Elvira Masinovic. The culture of Cheluna is what you’ll notice right away. The Oaxacan-style tile behind the bar and the beautiful rich colors of Mexico are immediately inviting, creating a homey and comforting feel that you might find in an eclectic cantina. 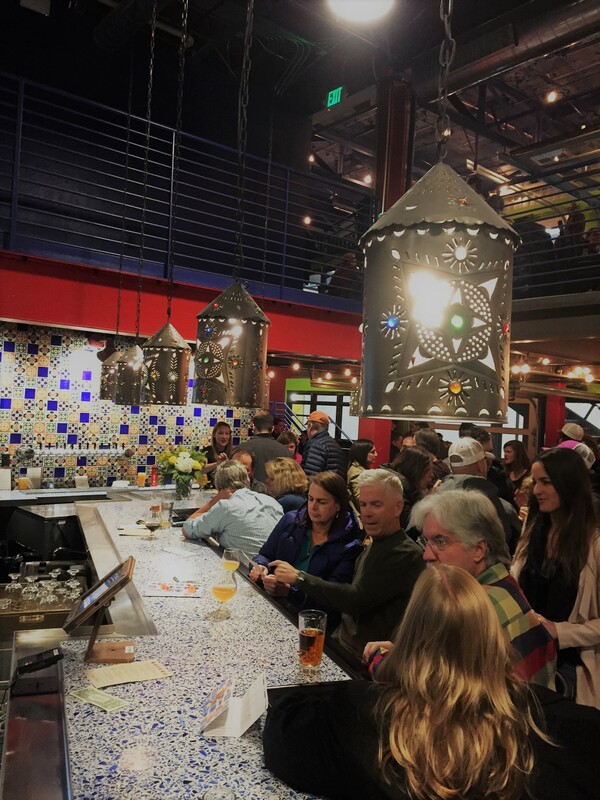 This welcoming culture is probably what caused Austin Wiley and Darren Boyd from Spangalang Brewery to join Javi and Jennifer on this adventure. Austin and Darren are providing support and advice when it comes to aspects of the professional side of brewing. It’s quite admirable that Javi reached out for an extra hand or two and checked his ego at the door. Javi’s homebrewing experience of 20+ years combined with Austin and Darren’s professional success has certainly resulted in excellent beer. In his “spare” time, Javi is an emergency room doctor. Somehow his crazy and eccentric personality can transform into a soothing soul with a stethoscope. His professional and warm bedside manner definitely follows him into the brewery. His face lights up when he talks about his two children and the love of his life, Jennifer. If you have the pleasure of speaking to either of them you will leave with a fuller heart, a warmed soul and a smile on your face. You’ll probably be looking at your calendar planning out your next trip as well. Javi & Jennifer. Photo source Cheluna Website. The beer reflects Javi’s heritage of Mexico and Germany. You’ll find the Coco-Xoco, a medium bodied Porter infused with cacao, vanilla, and toasted coconut as well as La Rubia, a German Doppelweizen on tap. Two very different styles are a great reflection of the beer that you can expect to drink currently and in the future. Recently tapped were the Low Rider Lager and Hibiscus Flower Lager. If you’re hungry both Comida and the Stanley Beer Hall are open and will deliver to Cheluna at no extra charge. Opening Day. Photo by Elvira Masinovic. 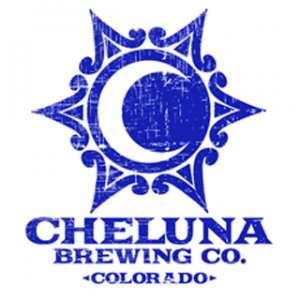 You can expect great things from Cheluna. They have full support from their community and it’s obvious that the combination of passion and beer go hand in hand. They are moving quickly and have an action plan that you’re going to want to be a part of. Stop by for a pint or two, some great conversation, and take a crowler to go. Bonus: Cheluna has a 10 foot TV screen, Wi-Fi, foosball table, large party reservations, tons of parking space, and Sweet Cow Ice Cream next door!